One of the first question we often get asked at Pine Creek is “How much will it cost to build my dream home or cottage?” While this is a very common question from new clients, unfortunately it doesn’t come with a simple answer. There is no standard formula, because custom homes and cottages vary greatly in terms of size, configuration, finishes, etc. If you were to go to purchase a car, each one on the lot would have a different price based on the size, gas mileage, trim package… I can bet you would find a significant price range between models (and brands)! Currently, the starting cost for most new builds is in and around the $250 per square foot range— not including land, of course. However, in our experience, by the time our clients add in a few upgrades, most custom builds will fall between the $275-$325 per square foot range, with some going up in price from there depending on how complicated the design is and what type of finishes are being used. What are the biggest factors that impact pricing? There are some considerations that you can keep in mind to help provide a rough estimate as to where your costs may end up. If you’re starting with a really complex design, filled with lots of jogs and intricate roof lines, it’s almost impossible to end up with a home or cottage that fits into a low price per square foot. By keeping a simpler footprint (which can still have great curb appeal and a great feel to it), you can have a substantial impact on the end cost per square foot. The different finishes available for custom homes today are endless. What’s important to know is that there’s a huge price range in every choice you make for the products that will end up in your dream home or cottage. For example: a custom tile shower can be 4x more expensive than an acrylic shower. Heated tile floors can be 4x more expensive than vinyl plank flooring. Custom stone countertops can be up to 8x more expensive than standard tops. The list goes on and on. Every decision you make on a custom home will provide you with the opportunity to spend more or spend less, all across a very wide margin. The location and physical features of your building lot can have a significant impact on the cost of your build. If you’re building in an area that is mainly rock, such as the Whiteshell and Lake of the Woods, your foundation cost may be affected, as well as the cost for services such as water and sewer or holding tank. If you’re close to the river, for example, you may be required to have a specific type of foundation based on the water table and soil conditions. The building lot factors are aplenty, and unfortunately sometimes they’re out of your control simply based on the geographic location where you’re choosing to build. Obviously, the most significant factor in home or cottage cost is square footage. 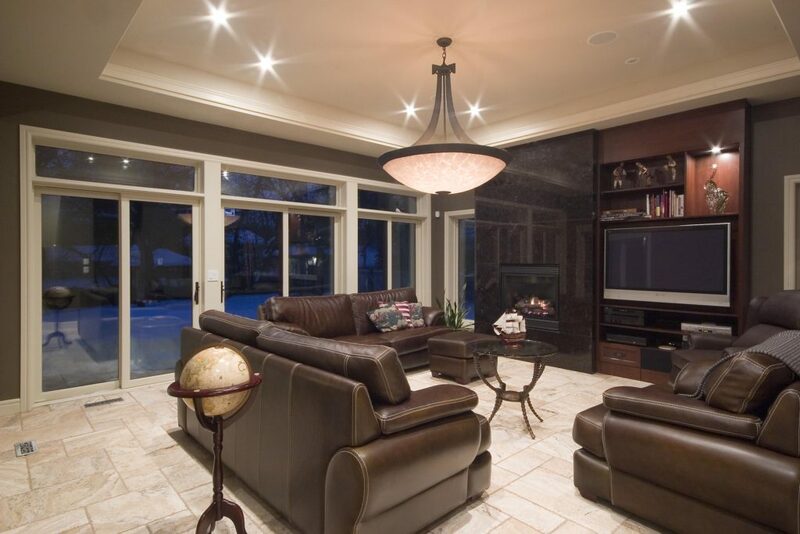 The key is to maximize the square footage of your home by designing an efficient plan, with no wasted space. A poorly designed 1,600 square foot home can feel like a 1,400 square foot home inside, while an efficiently designed 1,600 square foot home may feel as spacious as an 1,800 square foot home. Similar to conventional housing, there is also has a wide range for where final costs may end up. Timber frame adds about $50 per square foot on the section of the build where the timber frame will be used. 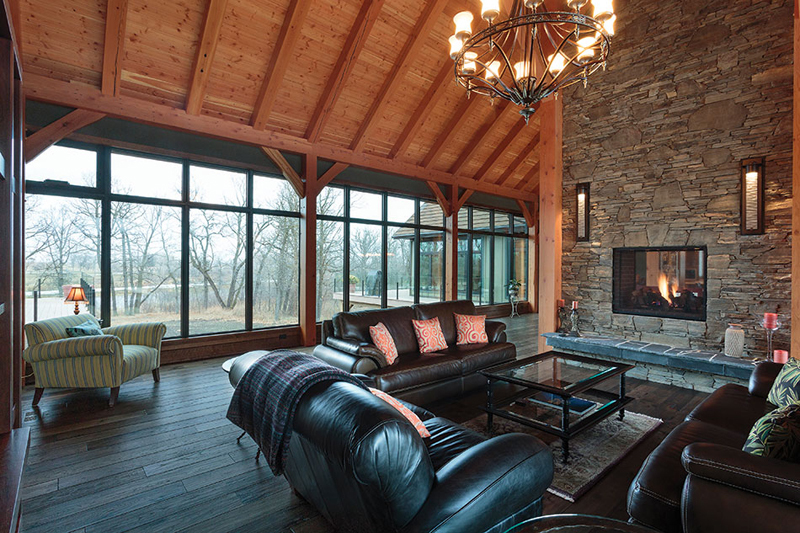 So, if you’re building a full timber frame, the starting point would be approximately $300 per square foot. Keep in mind that’s a starting point and with highly detailed timber work, the cost will go up from there. 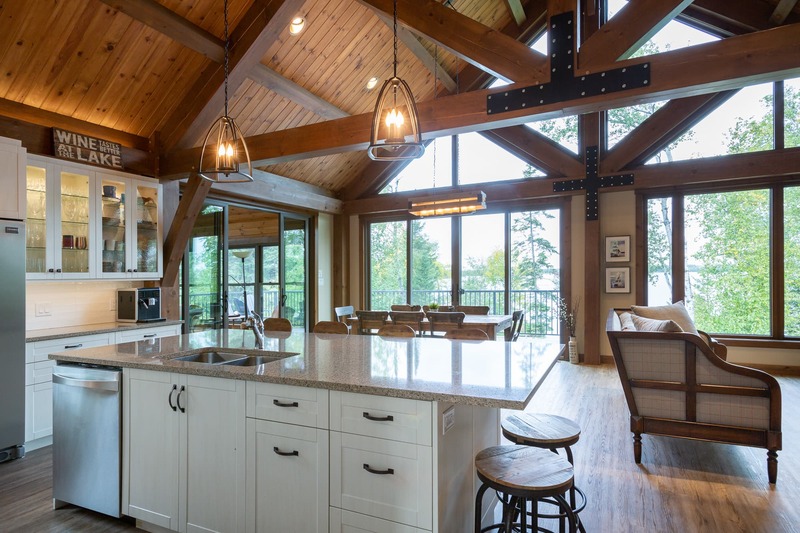 Often, the timber frame builds we do are “hybrid.” That means part of the home or cottage is timber frame and part is conventional. 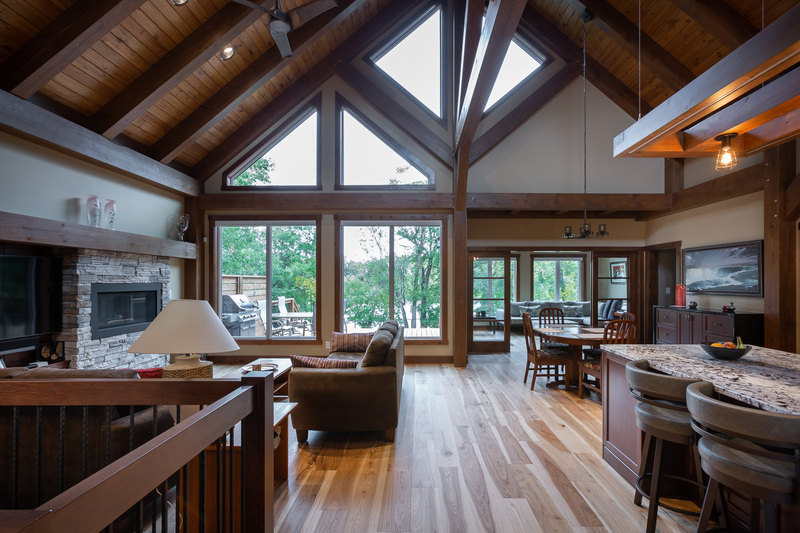 Generally, our clients want to put timber in the great room, where the most time is spent, and have the cost savings in other areas of the home, such as the bedrooms, bathrooms etc. For example, in a 1600 square foot hybrid timber frame, with 800 square feet having timber and 800 square feet being conventional, the timber frame portion would start at approximately $300 per square foot, and the conventional portion starting at $250 per square foot. Giving you an average starting cost of $275 per square foot on a hybrid timber frame. This would give an approximate starting point of $440,000 for a 1,600 square foot hybrid timber frame. As I’ve mentioned above, this article is simply meant to provide you with an estimated cost. We do full estimates for each build on a case by case basis, as each custom build is varies significantly.